I’m going to try to get through this season fairly quickly, so I’m planning to cover it in four updates: one for the early season, one before the January transfer window, one in early spring, and one for the last several games. This is Update One. Synchronize your watches. If you’ve recently visited the Silvio Piola to attend one of our practices and noticed me under a black cloud on the sideline, hugging my clipboard and scowling, maybe yelling a bit too quickly at Jacopo Sammarco for not buckling down in the speed drill, you should know that it isn’t because of our results. Our first few matches have gone well. 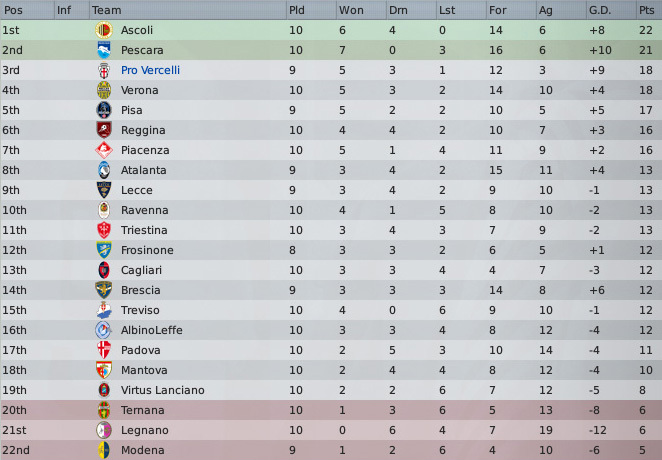 We’re third in Serie B after nine games, with 18 points from five wins, three draws, and a loss. I probably ought to be happy. Instead, I’m having the opposite experience to last season’s. I’m frustrated with the team, I feel like the general drift is against us, and I’m fixating on a few specific problems that I can’t figure out how to solve. Beaten Reggina 1-0 at home on a last-gasp, extra-time goal from David. Drawn 1-1 away to Modena, the worst team in the league, in a match we were set to lose until Miguel José scored from a corner in the 86th minute. Lost 0-1 at home to Mantova, the 18th-place team in the league, in a game in which we held them to just two shots on goal. Beaten Triestina 2-0 away, with good goals from Ibáñez and Landry Akassou. Drawn 0-0 at home with Brescia, the 14th-place team in the league. Drawn 0-0 away to AlbinoLeffe, the 16th-place team in the league. Beaten Ternana 2-0 at home on a goal from Landry Akassou and a penalty from David. Beaten Virtus Lanciano 3-1 at home on goals from Ibáñez, midfielder Lukas Tuma, and our new centerback Roni Zano. Beaten Padova 3-0 away, with two goals from Akassou and a header from Roni Zano. Decent, right? But we’ve played a lot of weak teams, relied on a few lucky late goals, gotten weak draws against three teams ranked 14th or lower, and generally looked unconvincing—and we haven’t played anyone else in the top five. If we can’t turn things around soon, I’m sweaty-night-terror afraid that our league position is going to dissolve like a mirage when you’re close enough to drink it. Quickly, what’s going well: Our new signings have generally worked out. Jacob Larsen is brilliant—such a huge improvement in goal that you can instantly see it in games. It’s already happened several times that a player has broken through our defense, come crashing in on goal, and made me curse at the screen before he even took the shot…only for Larsen to fling himself on the ball and make a save that van Dijk couldn’t have dreamed of. We’ve conceded fewer goals than any other team in the league, and he’s the fat slice of why. Two of our other summer transfers have been good as well, Alessio Crucitti (a left-back we signed after Inter released him from the dungeon of their reserves) and Roni Zano (an Israeli centerback I brought in as a backup but have increasingly tended to start over Matthias Cassano). What’s not: Jorge Ibáñez isn’t scoring. Two goals in nine games isn’t just shockingly bad, but considering that it’s the same total as our backup centerback, and that he’s taken 30 shots and only gotten nine of them on target (and seven of those were hit straight to the keeper), it’s a disappointing return, especially given that he averaged better than a goal every two games last season. I’m sure it’s temperamental and that he’ll go on one of his patented “don’t be mad at me” tears any moment, but he’s out for three weeks with an ankle injury at present, so who knows what form he’ll be in when he comes back. In the meantime, of our 12 goals, five have been from set pieces and one was a penalty. Not exactly inspiring stuff. Maybe I should separate their mentalities by an additional notch? I want the three midfielders to form a fairly tight unit, but I don’t want things to get crowded. At the same time, there’s already a meaningful mentality gap between them, so maybe I should reduce the space by a notch? Or maybe it’s just that I need to find a better player for that left spot: Iacopino and Vignau, who have mostly been filling it, haven’t exactly shone in the role, but they’re my best defensive central mids, so it stands to reason that other players would be even worse when they were plugged into the position. Maybe a player who met some minimum quality threshold could give me what I want out of that spot? The trouble is that I can talk myself into any one of these interpretations without quite being able to find real evidence for any of them, so I’ve been getting bitter but not trying to fix things. Suggestions welcome; in the meantime, I’ll start experimenting and let you know what I find. And if we’re still third in the table by the next update, I promise to look for more silver linings. 1.The ‘through balls’ often might be causing a lot of turnovers in possession which are punished by the rating system. 2.With a defensive midfielder there behind them, you can afford to cut them loose a bit more. If either of them have high jumping, I’d definitely get them making forward runs often, and that goes double if they have ‘likes to arrive late in the box’ as a special. 3.With three midelfelders close to each other they could be not seeing enough of the ball individually. Try giving one a high closing down so he goes to the ball in the first instance and the other guy covers. This should rake them across the pitch a bit. All very good thoughts. Most of those settings are context-dependent for me; the attack-minded midfielder closes down a lot more aggressively, for instance, against weak teams at home than against strong teams on the road, and it doesn’t seem to affect the ratings much. But I’ll try increasing the separation between the settings and see what happens. And you’re right that it’s sloppy to have everybody trying so many through balls. Partly that’s a legacy of Sammarco’s weird hybrid role (which might also be contributing to the other players’ struggles; I might try reining in his creative freedom a bit and letting the other midfielders go forward more). Ultimately I only care about the numerical rating handed out by the game to the extent that it’s an accurate guide to the player’s overall effect on our match performance—that is, if the game says a player is a 5.8 but I think he’s helping us win matches, I’m not going to pay attention to the number. Looking through the stats, it’s hard to see much correlation between the performance and the rating at times: Iacopino’s completed something like 75% of his passes, won 100% of his tackles, won two-thirds of his headers, scored twice, gotten six of 13 shot attempts on target, and committed no mistakes leading to goals, and his average rating is still under 6.5. The difference between a 5.9 and a 7.2 looks like it can sometimes come down to getting an assist or a couple of key passes. After watching a lot of highlights, I think the main thing the midfielders are doing that I’d change is holding the ball too long and losing it to aggressive defenders. That’s probably a sign that they don’t see good passing options given the instructions I’ve set for them, which might come down to the through balls instruction—or it might be a matter of pulling the wingers back a bit so they’re easier for the midfielders to pick out. Or both. It might also be a sign that I need more physical midfielders, since stronger, more agile players would do a better job of fending off those challenges. I’d say that you’re trying, generally, to make your mids be too many things at the same time: you’re trying to be conservative and yet also want them to be able to crack a defence open with a deft pass, and I don’t think the players are really good enough for that at this level. Sometimes less is more. I’d suggest that you keep their roles complementary, but well defined. As for Ewan Vignau, maybe he’s unhappy with his training schedule? He’s happy with his training schedule, unfortunately. I think he’s just hit his ceiling, although since I posted the screenshot a few of his declining stats have ticked up a notch again. 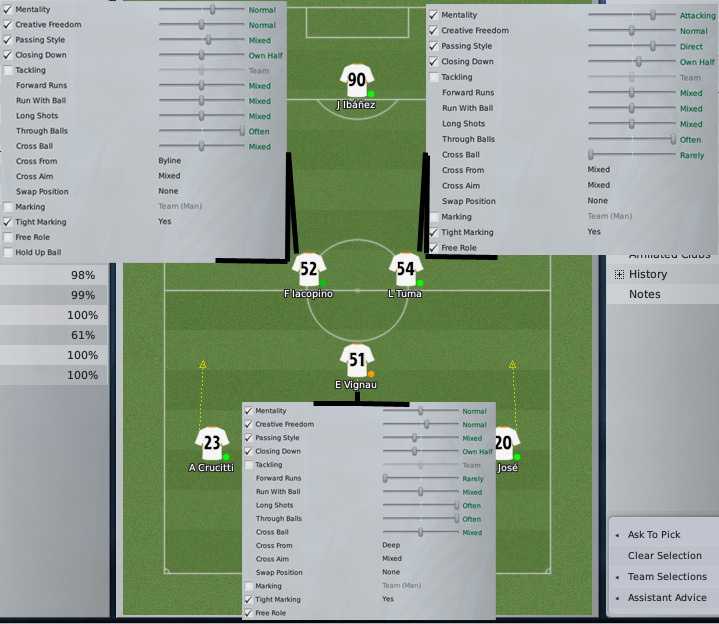 I know you mentioned your CB getting a couple goals, and I just want to make sure you have your corners tweaked because CBs can be crazy strong at attacking set pieces. Take your two players with the highest jumping/heading (jumping is a little more important than heading for this) and tell them to challenge the keeper on corners. Set your left and right corners to go to the 6-yard box. With decent players (16-17 jumping and a solid corner taker) you can nab an extra corner goal every few games. With really solid CBs (or whoever has the right skillset) it can get crazy, like Nemanja Vidic having 15+ Premiership goals (although at that point it kind of feels like cheating). That’s exactly the corner strategy I’m using, actually. I found it didn’t really start to work until I cleared everyone else out of the box, which makes it a little, um, unrealistic. But that’s the game. I haven’t seen results quite like you’re describing, though Miguel José (jumping 19, heading 14) has been getting 5-6 goals a year, and Zano’s already gotten four this season. I can’t tell why he’s doing so well, since his jumping is only 13, but then single attributes never tell the whole story in this game. Yeah, looking to statistics is inadequate in FM (as it probably should be, considering what it’s trying to represent), and obviously corner goals is also going to be very dependent on how many opportunities you get. Typically the gluts only come with really high-octane attacking teams. Maybe it’s more informative to think of it as corner goals as a percentage of team goals? I’m playing a game with Crystal Palace right now where 35 games in a quarter of my team goals have come from CBs on corner kicks – this seems pretty consistent with most seasons (http://s5.tinypic.com/140lvg2.jpg). Regardless of tactics, “the fat slice of why” is my new favourite turn of phrase. YOINK. Corners: I’ve had better luck with one player on “challenge” and an umbrella of attackers charging from the 18. The opposition near post marker drifts toward the corner taker and my target man gets 2-4 one on one jump balls a game. With two men challenging the keeper I seem to get more deflections and, obviously, fewer clean chances on goals. Using this tactic probably improved my league record by 10 points from one season to the next!